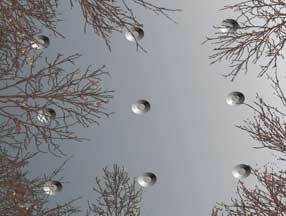 Computer illustration of Ricky Sorrells' perspective on January 1, 2008, looking up through the trees on his Dublin, Texas, property at a “tin barn grey” metal emitting “mirage heat waves” and embedded with cone-shaped holes he thought were equally separated by forty feet over the entire surface of the gigantic aerial craft above him. Graphic © 2008 by Gregory Watters for Earthfiles.com. 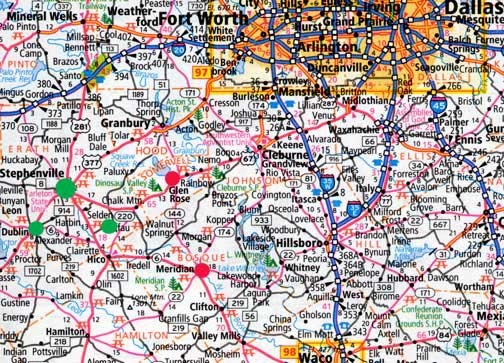 A triangle of three small towns (green circles) southwest of Fort Worth begins with Stephenville, a city in and the county seat of Erath County, Texas, population 14,921 in 2000 census. Then Dublin about eight miles southwest has a population of 3,754. Straight east of Dublin about ten miles is Selden with a full time population of about seven. Further east are Glen Rose and Meridian (red circles) referenced in first updated email below. Previous PostPrevious Could Our Universe Be A Virtual Reality Processed By Other Intelligence?